-As a beginner, it's best to start with the thinnest material that you can. Choose a leather, vinyl or suede that isn't too thick. Remember that most commercial leather products are sewn with an industrial machine. -Buy a leather needle for your sewing machine. -Consider buying a walking foot for your sewing machine (both this and the leather needle can be found at a sewing shop!) A walking food helps grip the leather and feed it through your machine more smoothly! -Change your stitch length to 3-3.5. 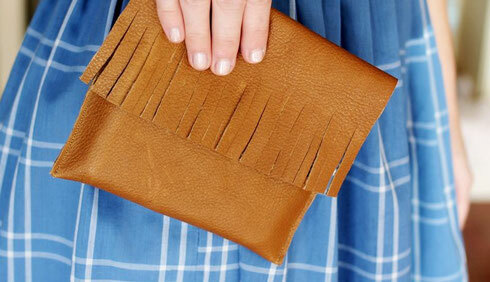 You don't want tiny stitches when sewing leather! 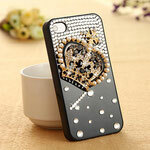 -Be minimal with pins. If you use them, test a scrap piece first to see if the pin holes will disappear or stay visible. -Test stitch scraps before starting on your project. -If your leather gets stuck in the machine, lift the foot and allow the leather to relax for a moment before continuing. -Leather, suede and most vinyl fabrics are dry clean and hand wash only, so don't put them in your home washing machine! 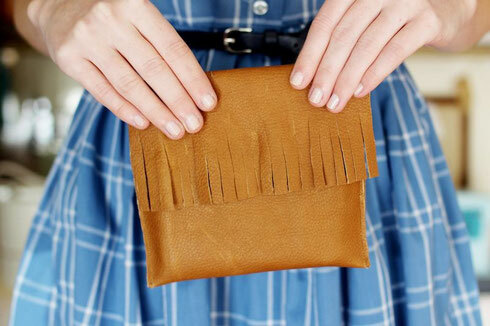 This small leather fringe purse is the perfect first project when sewing. 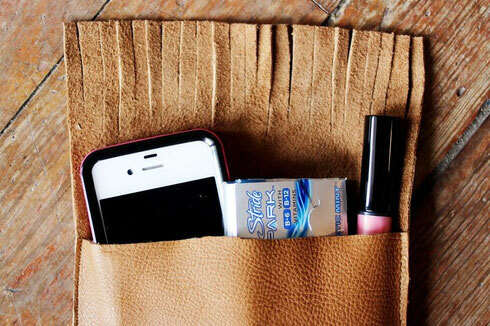 It's the perfect size to hold makeup or money in your purse. 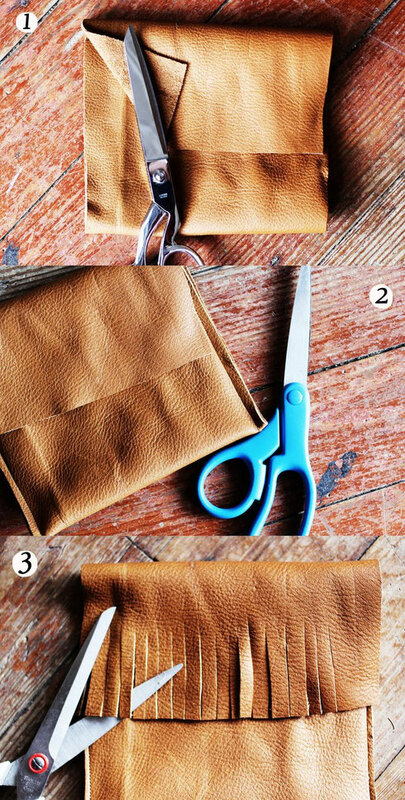 Step 1: Cut a rectangle of leather. Ours was a small purse and the piece measured 6 inches x 14 inches. You can make it larger if you want a full size purse. Step 2: Fold your leather so that you see where the pocket and flap will be. Stitch three sides to enclose the two sides and stitch down the bottom of the pocket. Trim any excess from the sides of the seams. Step 3: Cut fringe on the flap with a pair of scissors. Enjoy! This sewing basics series was created in collaboration with Missy Creed of Momentum Fashion. Missy is a talented seamstress who sews for Red Velvet!